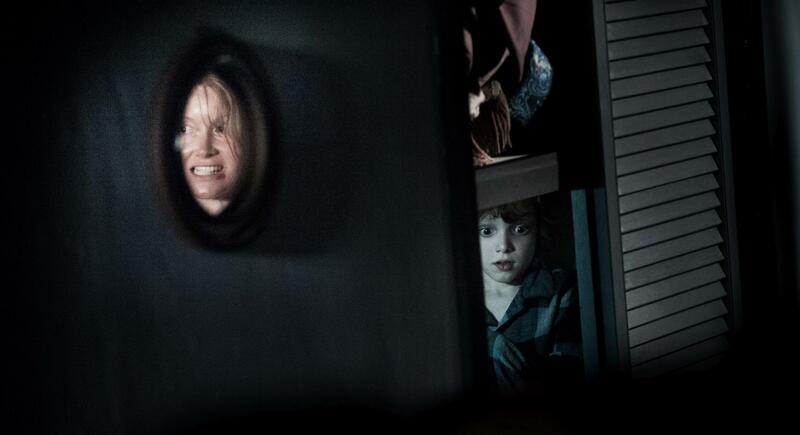 The Babadook is out to get Amelia (Essie Davis) and her son Samuel (Noah Wiseman). Yet for the first third of the film, there’s not the slightest hint of a monster. A rhythm is established, and the film’s language is as well; cross-cutting means something bad is about to happen, for instance. But just as I started to get frustrated with the movie’s pace, Samuel tells Amelia that she can’t see the Babadook because “it wants to scare [her] first.” And that’s when The Babadook set out to get me. You can tell this is writer/director Jennifer Kent’s first feature. That’s not a bad thing. Kent is absolutely fearless. She’s made a horror film that’s less concerned with scares than it is with being a film. The Babadook is scary, but that comes as a result of a passion that’s rare in contemporary horror films. Kent plays with horror conventions in a clever way. The genre cues in the film’s first half – a door creaking open, footsteps and scratches in the night, a child and a dog perceiving a monster that an adult cannot – are all familiar to anyone who’s watched a scarier film than Halloweentown, but they’re all there to build an understanding with the audience. This lulls us into a false sense of security – Kent gets us to assume we know what she’s up to. Once the film’s intentions become clear, these horror clichés take on a new context. She smartly leaves it to the audience to make the connection. The “twist” (such as it is) is hardly original, but focusing too much on the plot will only hurt your experience with The Babadook. I know that sounds like “check your brain at the door” rhetoric, but this isn’t one of those films. It’s just that watching this film for the plot beats means almost all of it will go right over your head. You don’t need a complex understanding of film to appreciate or enjoy The Babadook, but its formal elements are the main attraction. The film features gloomy, overcast cinematography and sets that look like they’re falling apart. These elements create a dreary, dreamy tone. The editing is minimalist, stringing together brief images to convey ideas rather than lingering on them to ensure that everything gets across. There’s a distinctly comprehensible style at play; you’ll notice the techniques even if you can’t name them. The film maintains intelligence along with broad appeal and mixes them together in a way you don’t often see. You don’t even have to think too hard about it because the film’s subtext moves into the foreground by the final act. There will come a moment while watching The Babadook where you realize that the narrative of the movie is doing something new. For me (and I hope you’ll trust me to dance around spoilers), it was when the knife came out. For you, it might be the second time the book gets read. For yet another person, it might not come until the ending. But you’ll know it when you see it, because big neon lights that read “This Is The Thing The Film Is Doing, Do You Get It?” basically start flashing. You might be bothered by Kent’s lack of subtlety, but it actually works in the film’s favor. This is a film about physical manifestations of mental anxieties (the Babadook serves as an obvious metaphor, for example). Intangible concepts are given tangible form while denying the reality of a concept only makes its physical counterpart more powerful. If Tinkerbell’s survival hinges on people believing she’s real, the Babadook gains power from people believing he isn’t. The titular Babadook moves through various layers of narrative until it can directly manipulate the audience’s perception. First, it jumps out of a storybook and into the main narrative. But it transcends that layer as well, and takes control of the meta-narrative of the filmmaking itself. By the third act, we leave Amelia’s perspective and enter the monster’s point of view; that is to say, there are POV shots from the Babadook. Perhaps most importantly, The Babadook is fantastic as a horror film. It’s not scary per se, at least not like horror films which focus on jump scares and little else. But true to the genre’s name, this film will horrify you. The Babadook itself isn’t half as scary as Amelia hallucinating that her son’s been murdered. I’m a complete chicken when it comes to horror, so I watched The Babadook on my laptop on a sunny afternoon. It didn’t rob the film of any of its impact. The secret to the film’s success is simple: It’d be just as scary without a monster. Hopefully, Kent will make a lasting impact on her peers. “You can’t get rid of the Babadook,” and I can’t imagine ever wanting to.